Snow chains and shovels are hardly routine items to carry on a windsurfing expedition, but they were essential for members of the RN Windsurfing Team as they prepared to brave the ‘Beast from the East’ to board flights across the UK. 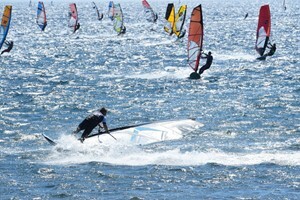 Within hours, their courage was rewarded with a sunny Saturday afternoon session in at El Medano, Tenerife. This was to be the ‘loosener’ for a week of intensive coaching from all-round windsurfing legend Colin ‘Whippy’ Dixon – so named for his Professional Windsurfing Association sail number K-99 (geddit?). Day two saw over 6 hours on the water focussing on flat water skills such as stance, tacking and gybing – basics we all thought we had totally nailed. The camera, however, never lies, and there were some hard truths to be learned from video analysis the following day. Unfortunately, redemption would have to wait, as a few light wind days shifted the focus to skills and drills on bigger equipment and a little paddle boarding for fitness. Deliverance came in the form of two cracking 25kt days, where all the RN sailors took to the water pushing each other to achieve perfection. With conditions perfect for coaching from the beach, trial and error soon gave way to success as sailors all of a sudden started screaming round fully-planing carve gybes and duck gybes with impunity. The buzz on the water, and throughout the week, was infectious and every sailor came away from the camp able add at least one new move to their arsenal, and a host of others with an improved success rate. Only the Carving 360 remained elusive to all, despite a number of attempts that looked to be nailed on until the last second. There is, of course, always next year.